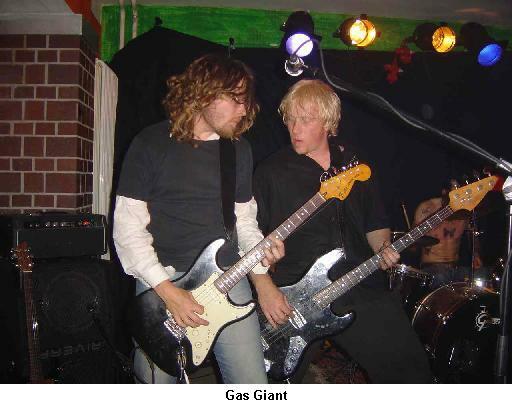 On the road again with Gas Giant. Tommy, Thomas and I met at the train station to go to Lund to pick up the van (1800kr for 3 day weekend deal!). All goes fine and we get there and get the van. Thomas is to drive and within 50 meters is not used to the automatic and hits the break like it was a clutch and Tommy spills 50% of his hot coffee all over the back of the van and his clothes! Way to go! We are at the rehearsal room at 11:15. Stefan and Jesper have most of the gear out and ready for us. We are on the road by 11:35 towards the ferry at Rødby. We are all in good spirits and ready to rock. We are listening to the High Times Stoner Rock Collection CD with Gas Giant, Nebula, Unida, COC, Clutch, etc. Great compilation CD. The ferry ride is pretty uneventful. We bought 2 cases of beer, a bottle of whiskey and 1 case of coke and ate some food. We are close to Lübeck now and should find Schwerin around 16. The traffic is incredible and we hear some Gas Giant rehearsal stuff and ILDHU. The bands version of Reasons by On Trial sounds really good. We heard a whole ORB CD as well. I think we all liked it but not Stefan. Now some Tool as we crawl along. It may be 18 by the time we get there with this traffic. People are very happy now and one case of beer is nearly gone! We did not have a map of this place but it was easy to find and we get there about 17:15. The band sets up very fast and try to do a little soundcheck before we head to a bar to see the Denmark vs. Bulgaria football game. Denmark wins the game 2-0 and the band are in HIGH spirits, maybe too high. We also met up with Frank, a guy who writes for Moonhead and Aural Innovations. He will do an article on Gas Giant for Moonhead. We are also invited to the Moonhead festival in Afschafenburg the last weekend in October. 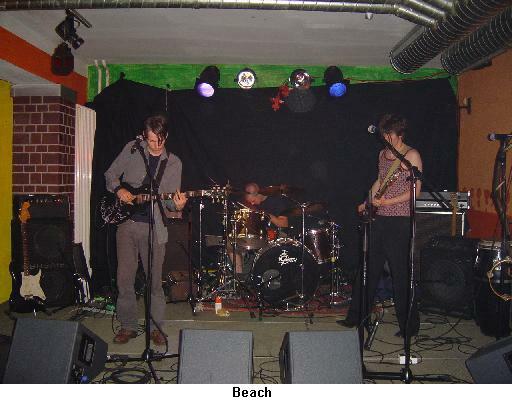 The other band, Beach, from Berlin has arrived and is waiting for us to finish our soundcheck. We do it quick and then grab some meat stew and nice bread backstage and hear some Doors. Some beers and joints and everyone is happy. Really happy. Frank has a nice chat with the band for some time and they tell him some wild stories and things. Blow his mind, I think! Beach start at about 10.30 They described the music as psychedelic Indie rock. There were about 40 people I guess. A lot of young people were on the street outside the club. I hope some of them come in. The band has a very wild bass player and the music is really hard to describe. Dark, moody rock, not much psych and few lead guitar parts. The drummer and bass player play very well together. I think it is the strange rhythms that give the band this special sound. The crowd liked them and I thought they were pretty good as well and quite original as I don’t know how to describe them. I was a bit worried about how the band would play today as they had drank a lot of beers and seemed on the verge of getting drunk before hitting the stage. 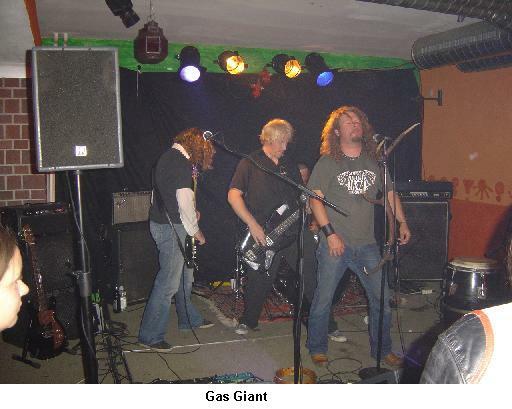 Ok... Well, Gas Giant totally rocked! They opened with Too Stoned into Firetripper into Moonshake. A heavy intro but the band was flying, the sound was great and the crowd (maybe 75) was into it for sure. Back On The Headless Track sounded great and then into Ride The Red Horse, a song out of the set for some time now. Stefan goes into a jam while some of the band go into Phantom Tanker. It sounds strange but slowly morphs into Phantom Tanker. Strange but interesting. The debut of the bands version of Reasons by On Trial is played next and sounds great. They really have made a very cool version of this song. Never Leave This Way is played and Stefan starts it a bit faster as the band had spoke that it had become too stoned the way they had been playing... well... the band end up in the stoned version anyway but it flys and the crowd loves it! The band now pulls out Embrace, an amazing song on the Portals Of Nothingess CD and not played live with Tommy ever. It is a bit rough this version but sounds heavy and great. This will be the bands new killer number if they work on it a bit more. The jam that took off around 8 minutes lasted for more than 20 minutes and Stefan did some amazing guitar looping and jamming that just blew my mind. The whole band was just totally flying in all sorts of insane grooves. When they finally stopped exhausted the crowd went completely nuts and screaming for more. The band were really tired after that jam and Stefan had broken the strings on 2 of his 3 guitars. They had to come back out and they played Mama Cool. The band started playing before Stefan could get his Dan Armstrong guitar completely tuned so the guitar sounded strange to me but the crowd had never heard the song and it rocked! What a show!!!!!!!!!!!!!! We sold a lot of merchandise and party until 3 in the morning before I have to drive and follow the taxi to the youth hostel, which overlooks a huge lake. I try to crash out but the others stay up for another hour and get pretty drunk!